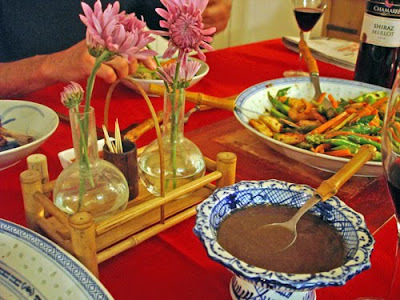 The best way to celebrate Chinese New Year is a simple dinner at home with your family. You don’t have to get stressed with a big production. Earlier in the day, I had given a Wok Star cooking class to celebrate Year of the Tiger, so I didn’t feel like going to a crowded, noisy restaurant that evening or pay the high prices usually jacked up on these occasions. A red tablecloth is important because it signifies good luck. 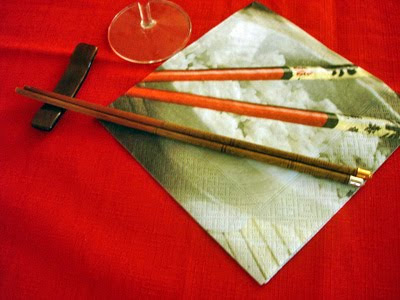 My friend, Irene had given me some beautiful napkins with “chopsticks”, so appropriate for the occasion, thanks. My brother-in-law is Italian, so he picked out a Chamarre Shiraz Merlot which went very well with everything. I noticed my sister had snuck a duck leg on her plate! I had bought a whole roast duck (everyone’s favorite), already carved and just needed crisping up under the grill. It was so much fun to cook with my sister, reminded me of our childhood, cooking, laughing with our mom and two other sisters. 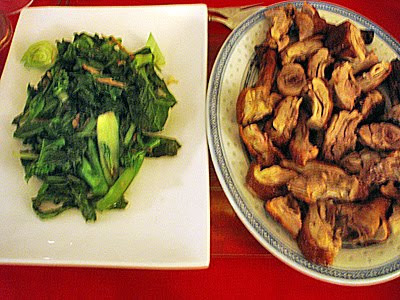 I also fried up a plain veggie dish of Chinese broccoli and bok choy. 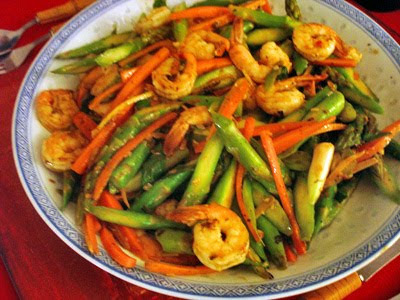 A dish of plump shrimp with a spicy, zesty brown bean sauce, asparagus and carrots. This is a dish I actually made in class earlier so I had all the fixings already so no big deal. Everything was ready in about half an hour! 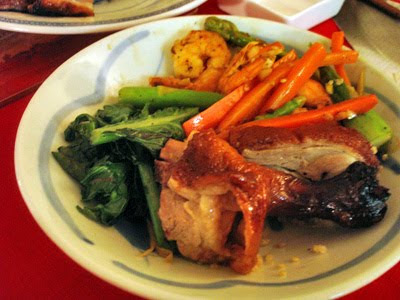 This was my plate with the duck leg, yummy. 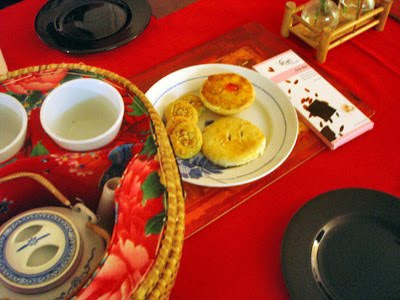 For dessert, a few Chinese cakes like almond cookies, coconut tart and melon pastry. My sister brought some Vosges chocolates. They have the most amazing and strange combinations but so good, it perks up your taste buds. We even went to the Wynwood/Design District Art Walk after dinner. I’m not sure how I managed it as I’d already been on my feet for about 6 hours! We walked probably 2 miles, popping into all the galleries was fun, many had Valentine themed art and gifts. My brother-in-law bought me a lovely bangle from Ecoist. 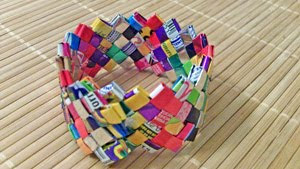 It was made out of recycled sweetie wrappers, so cheerful. What a lovely way to celebrate Year of the Tiger and Valentine’s Day! Love to hear how you spent your Chinese New Year? 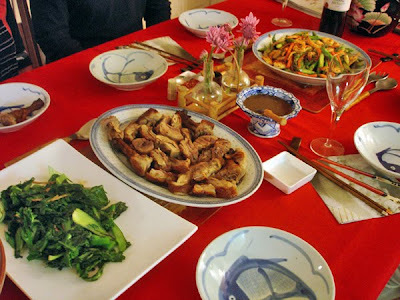 Chinese New Year 2015: Eat in or Eat out? 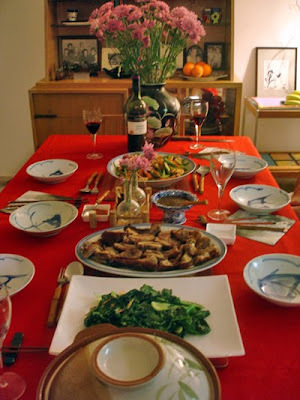 9 Responses to Chinese New Year – simple home dinner is best! Eleanor thanks for posting this lovely dinner! 祝你新年快乐!